Gratitude, self-respect, integrity, compassion - all values we hope to successfully pass on to our children as they get older. But how do we know we're teaching our children in a way that's actually getting through to them? 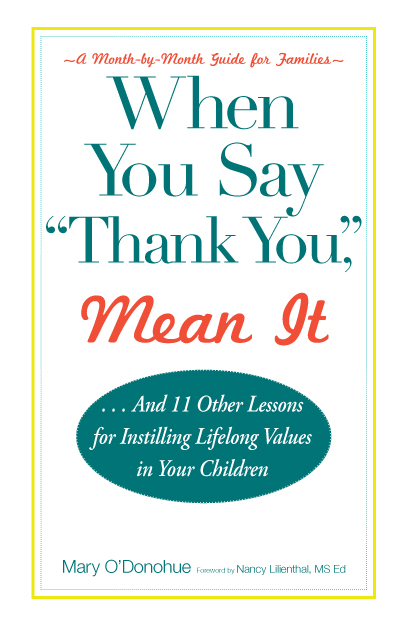 In When You Say Thank You, Mean It...And 11 Other Lessons for Instilling Lifelong Values in Your Children (Adams Media, a division of F+W Media; October), you'll learn how Mary O'Donohue, a proud mother of two, developed a practical program that allows parents to impart timeless values in their children over the course of one year. 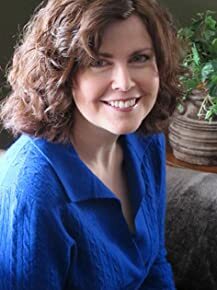 Focusing on one key value each month, O'Donohue has devised an effective and creative way to engage the whole family through weekly exercises and activities, and shares with us what she learned from applying this program to her own life. By inspiring common values such as lifelong learning, a sense of joy, and respect for others, this unique guide offers purposeful advice for raising joyful, thoughtful children who will make their world a better place. It's every parent's nightmare: their child opens a gift from a well-meaning relative, and instead of, "thank you so much, Aunt Susie!" they say nothing. Then, when prompted by mom's "Hey, what do you say?" they give a sigh, an eye roll, then a long and forced: "thaaank youuuu." 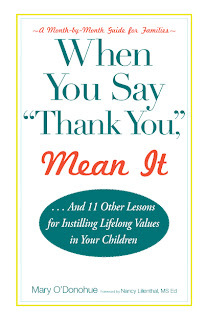 This is exactly the type of situation that jolted author and proud mother of two, Mary O'Donohue to the sudden realization: prompting children to "say thank you" is merely training them to "act" grateful. It doesn't teach them to be grateful people. The same thing goes for other values. Telling kids to "say you're sorry" or "say please" doesn't teach them to be remorseful or respectful either. These words ultimately just scratch the surface of the values parents want their children to learn. Values like gratitude, respect for others, integrity and compassion are all qualities we hope to successfully pass on to our children as they get older. But how do we know we're teaching them in a way that's actually getting through? That question led Mary to develop a fun and practical program to effectively teach values to children in a way that has meaning and will stay with them as they grow into adulthood. Mary and her husband Jim have been married for fifteen years and have two children. She balances being a mom with a long career in television production. Mary has worked for ABC, CBS, and NBC network stations, on shows such as "Today" and "Meet The Press," as well as on numerous music and entertainment programs including "MTV Unplugged," "Mariah Carey at St. John the Divine Cathedral," and "An Opryland Christmas;" and on many talk shows including "The Oprah Winfrey Show." She's an avid traveler, having spent time in Ireland, England, Wales, France, Germany, Italy, Mexico, and China. She loves to read and has a passion for photography. Mary plans to donate at least 10 percent of her author's net profits to charities benefitting families and education. As a father I am always looking for ways to be able to teach my daughtes the meaning of the words that they say and to make sure that when they say something that they mean it. In this book, the author does a great job at getting people to consider the values that you are instilling within your own kids. One of the great things within this book are the exercises that it contains as well as the guidelines that it sets before the readers. I have found these exercises to be invaluable and ones that I know that I will continue to practice with them in the future. If you have children, this book is a must have, and the exercises and resources that it contains are amazing!